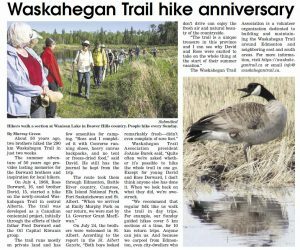 The Waskahegan Trail Association is a non-profit organization dedicated to the preservation and maintenance of the Waskahegan Trail in the province of Alberta. In 2016, it was facing a crisis. The current membership was aging, new members were not renewing, and volunteers were not staying. Furthermore, public participation in the weekly guided hikes was declining. Printed brochure that promotes the trail and the organization and communicates the brand. New responsive WordPress installation that supports event scheduling, announcements, and blogging by its members. Online registration and purchase of materials through PayPal. Awesome work. Thanks for all the time and effort you put into making this an efficient, welcoming, evolving hikers club! Just wanted to say it’s a real treat to read you hike descriptions before and after each hike. You’re doing an amazingly wonderful job at this — on top of everything else you’re doing for the WTA. And we’re getting some good turnouts for our hikes as a result. Thank you very much. The website is the public face of the Waskahegan Trail system. Area residents and visitors alike discover the trail through their search engines and links on curated lists. Once they arrive at the website, they are entertained by blog posts about the previous weeks’ hikes and trail maintenance. The beautiful landscapes, interesting flora and fauna, and hikers and volunteers of all ages often inspire them to come out to the next hike or to join the association. The website’s calendar keeps members and the public informed of upcoming hikes. The online membership system makes it easy for new people to join and for existing members to pay their dues. 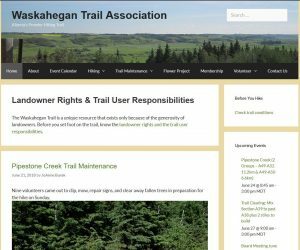 Ever since the Waskahegan Trail Association started sending short weekly emails, member retention has increased and volunteers have stepped forward more often. 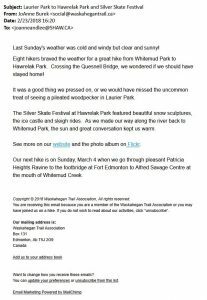 These weekly emails describe the highlights of the previous week’s trail maintenance and hikes and provide a reminder about the next guided hike. Sandwiched in between are announcements, reader feedback received, calls for volunteers, and other relevant news. The WTA executive believes that because they are a routine part of their members’ week, the members feel engaged with the association and care about its success. 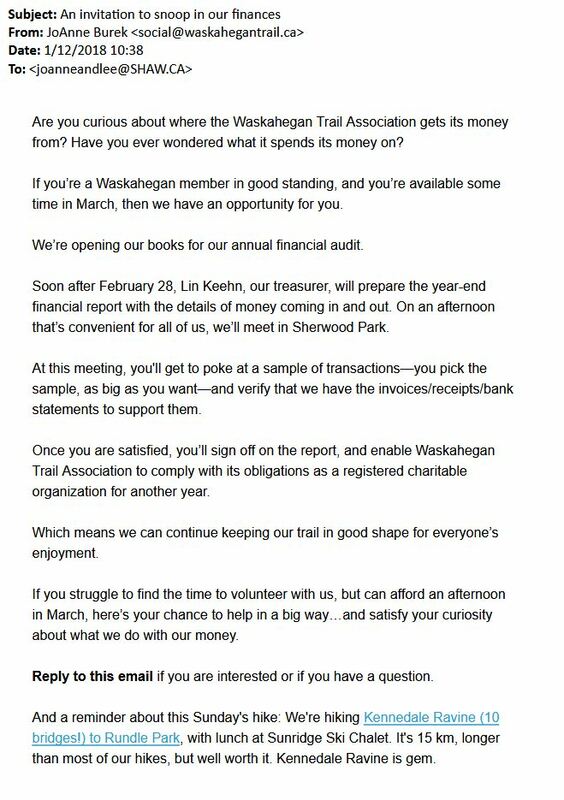 Here is an email that was used to successfully recruit two volunteers to audit the WTA financials. The subject line is An invitation to snoop in our finances. 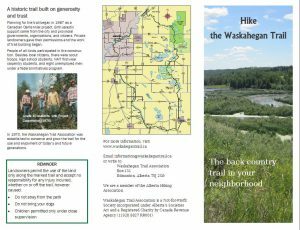 This tri-fold brochure promotes the Waskahegan Trail and its activities to visitors and prospective members. The brochures are stocked in area visitors’ centres and other areas by the members. I'm JoAnne Burek, the copywriter behind Wordbeats. I study your business like an investor, work with you like a team member, and refresh your weak or broken pages with crisp and compelling messages that build your brand and get your customers nodding yes.